Two notorious criminals, Amit and his brother Pradeep, both residents of Palwal town in Haryana, reportedly escaped from the lock-up of the city police station here in the wee hours today. Eleven persons, including three members of an NRI family, were injured when the mini-bus they were travelling in met with an accident near Shyamgarh on the GT road, 15 km from here, this evening. A murder convict, who was on parole, was allegedly shot at on the local Bhattu road last night. He was seriously injured in the incident. Elaborate security arrangements have been made by the authorities here in view of tomorrow’s birth anniversary celebrations of Shah Satnam Singh, the predecessor of Dera Sacha Sauda chief Gurmeet Ram Rahim Singh. A heavy turnout of dera followers is expected in view of the celebrations tomorrow and, in fact, thousands have already gathered in the headquarters of the dera situated on the local Begu Road. Political parties which field their dummy candidates with an intention to hoodwink the ceiling on election expenditure by using vehicles permitted in the names of dummy candidates for its main candidates will not be able to do so in the coming Lok Sabha elections. The police has registered a case against Subhash Jangra, a local Congress activist, on the charge of firing at a public place from his licensed firearm. Degrees were conferred on 688 graduates and postgraduates from arts, science, commerce and professional courses while 26 students were awarded gold medals at the annual convocation of Government PG College for 2007-08 here today. Over 5,000 poultry birds died due to suspected water poisoning in Rajthal village of Jind district today. Officials of the Health and Husbandry Department said the possibility of bird flu appeared remote. District police chief CS Rao today cracked the whip on negligent cops and suspended three policemen, including an SHO and a police post in charge. District and Sessions Judge HP Singh dismissed a revision petition seeking registration of a criminal case against Dera Sacha Sauda chief Gurmeet Ram Rahim Singh yesterday. A Hindi epic, “Seehi ka Sant”, written by a noted author, Dr Leeadhar Viyogi, was released by editor of the Dainik Tribune Naresh Kaushal in SD College auditorium in Ambala Cantt today. The epic is written on the life of poet Soor Dass. While constable Dheer Singh, who was acting as the sentry at the lock-up, has been booked for dereliction of duty under Section 223 of the IPC, a case under Section 224 of the IPC has been registered against the escapees. A senior police official said after the police came to know of the duo’s escape, their rented hideout in Mohalla Nai Basti here was raided by the police, but without any success. Amit and Pradeep, who had been secured by the Rewari district police from the Palwal jail on production warrant recently, were on a two-day police remand which expired today. They were wanted in a case of burglary in a jeweller’s shop here in October 2008. They had reportedly stolen jewellery worth about Rs 70,000 from the shop. Interestingly, the duo was earlier arrested in connection with a criminal case by the Delhi police from whose jurisdiction they were procured by the Palwal police on account of their alleged involvement in a criminal case there. Eleven persons, including three members of an NRI family, were injured when the mini-bus they were travelling in met with an accident near Shyamgarh on the GT road, 15 km from here, this evening. They were on their way to Jalandhar from the Delhi Airport. The condition of four out of 11 injured, including NRI from the UK Sanila, wife of Tyara Singh, her son Deepu and daughter Kiranjit and Rajan Deep, was stated to be serious and they had been referred to the PGI, Chandigarh. Rajan Deep from Jalandhar had gone to Delhi to receive the guests, sources said. The other injured were brought to the trauma centre in Karnal and were out of danger. The driver of the mini-bus, Harbinder, said the bus went out of control when a tyre of the bus suddenly burst. The victim has identified the accused as a son of the person, whose murder had led to his conviction. Dalsinghar, a class IV employee of the Public Health Department, was killed sometime ago after he was allegedly beaten up by Ishwar Singh and others. Ishwar Singh, who lived in Dalsinghar’s neighbourhood, was convicted in the case and was on parole. The incident took place when he was on his way to his residence at about 10 pm yesterday. Six persons waylaid him and when he tried to run away from their clutches, the miscreants allegedly fired at him, injuring him seriously. The victim approached a police barricade, from where the police rushed him to a hospital. Later, he was shifted to the PGIMS, Rohtak. According to police sources, the victim has named Dalsinghar’s son Ram Parvesh, his uncle Dadiwala, cousin Rama Kant and three other unidentified persons for the murderous attack. SHO Ajaib Singh said the police had registered a case under Sections 148, 149, 341 and 307 of the IPC against the accused on the complaint of Ishwar Singh and begun investigations. Elaborate security arrangements have been made by the authorities here in view of tomorrow’s birth anniversary celebrations of Shah Satnam Singh, the predecessor of Dera Sacha Sauda chief Gurmeet Ram Rahim Singh. A heavy turnout of dera followers is expected in view of the celebrations tomorrow and, in fact, thousands have already gathered in the headquarters of the dera situated on the local Begu Road. The dera will organise a congregation at the dera headquarters. It will organise a “majlis” in the morning and a “bhandara” in the evening, according to a spokesperson. The month-long celebrations, however, started from January 1 and the dera has organised several activities like blood donation camps, health camps and food and clothes distribution camps during this period. With the INLD and the BJP organising their “vijay sankalp rally” on the same day, the workload of the authorities have increased manifold. The authorities have promulgated prohibitory orders under Section 144 of the Criminal Procedure Code in Jalalana village, the birthplace of Shah Satnam Singh, where the Shah Satnam Singh Education and Welfare Society, a subsidiary of the dera, is organising sports tournaments in coordination with the village panchayat and certain old dera followers, led by Labh Singh, a nephew of Shah Satnam Singh, who has broken up with the dera, wanted to hold their separate “satsang” on this occasion. The authorities have, however, denied permission to the old followers led by Labh Singh. Earlier, dera chief Gurmeet Ram Rahim Singh had announced to organise a congregation in Jalalana on January 12, but the authorities had denied permission after strong protests from Sikh organisations, led by Sant Baljit Singh Khalsa of Dadu Sahib Gurdwara and Sukhwinder Singh Khalsa of the Guru Granth Sahib Satkar Sabha, Haryana. The Election Commission of India (ECI) has issued instructions to curb such a practice usually followed by political parties during elections. A communication in this regard has recently been sent to the Chief Electoral Officers (CEO) of all states and union territories in the country. The CEOs have been directed to check the video recording of election campaigning by suspected dummy candidates so that immediate action under Section 171-H of the IPC could be initiated in case the candidates are found canvassing for other candidates and not for themselves. In its letter no 464/INST/2008/EPS to the CEOs, the ECI has stated that the Election Commission has received feedback during the recent assembly elections that dummy candidates are being set up by various political parties and candidates in order to hoodwink the ceiling on election expenditure and to further the interest of the party candidate. The dummy candidates are normally fielded for various reasons especially for using the permitted vehicles for canvassing for the main candidate, nominating polling and counting agents in order to provide additional facilities to the main candidate for carrying out their electoral campaign more effectively and to affect the level playing field. Sources said during the recent assembly elections, electoral officials while checking the vehicles of suspected dummy candidates found campaign material of another candidates being carried in the vehicles. The ECI said in such cases, the electoral officials must use a video camera for recording the statements of witnesses and collecting evidence. Thereafter, a notice should be issued to the candidate and simultaneously vehicles permitted for the campaign of such dummy candidates and their actual use should be reviewed. As per the instructions, the returning officer/observer should also serve a notice on the candidate in whose favour the dummy candidate was found to be operating asking him to include the expenditure incurred by dummy candidates in his election expenditure. Besides, the ECI pointed out: “The law permits each candidate to have one polling agent and two relieving agents on the poll day. Hence, appointment of polling agents by the dummy candidates should also be tracked, extra precautions should be taken by deploying micro observers and installing video cameras at the polling stations concerned.” A close watch should be kept on the activities of counting agents of such dummy candidates in the counting centres, the ECI added. The CEOs have been directed to bring these instructions to the notice of all concerned and to make it clear in the meetings of political parties/candidates about this misuse, informing them about the follow-up action which would be taken in this regard. A case has been registered at the Kurukshetra city police station on the complaint lodged by Rajya Sabha MP Dr Ram Prakash’s security guard, havildar Kashmiri Lal, who has been convalescing with an injury in his left arm caused by a bullet fired from the gun of Jangra. The police said no arrest had been made so far. Kashmiri Lal, security guard posted at the house of MP and former HPCC working president Ram Prakash, sustained a bullet injury when Jangra’s gun went off “accidentally”. Working president of the Haryana Pradesh Congress Committee Kuldeep Sharma, who was the chief guest on the occasion, pointed out that in spite of India’s spectacular progress in the field of software, space and agriculture, human resource development had not been of the same level. There was an urgent need to develop human resource to meet the challenges thrown by globalisation, he added. He exhorted students to take a lead in saving the environment and ecology for sustainable growth and cautioned that failure to protect water and air from toxic gases and effluents would lead to disastrous consequences. Presenting the annual report, the principal of the college, Dr RS Sharma highlighted the achievements of the college. Kulwant Mor, owner of the poultry farm where the birds were found dead told the officials who visited the spot that he suspected that they died due to poisoning. 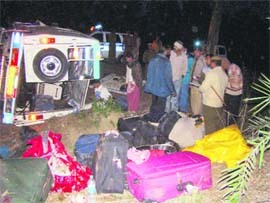 While the SHO and an assistant sub-inspector have been suspended for disposing of a case of the recovery of an unidentified body as one of normal death though evidence strongly pointed towards murder, the police post in charge has been suspended for failing to check overloading in private buses in his area, resulting in the overturning of an overcrowded bus. According to police sources, the body of a teenaged girl was found in the Khajuri minor canal on January 18. Ram Kishan, SHO of the Bhuna police station, and Bahadur Singh, an assistant sub-inspector, did the investigation and disposed of the case under Section 174 of the CrPC, a procedure followed when the police finds a body with no indication of foul play. When the photographs of the body went to SP CS Rao, he found that a thin rope was found around the neck of the body, indicating that she had been strangled before being thrown into the canal. The SP ordered the registration of a case of murder and causing disappearance of evidence and suspended the cops concerned. Bhal Singh, an ASI and in charge of the Nagpur police post, has been suspended by the SP for failing to check the overloading of private buses. 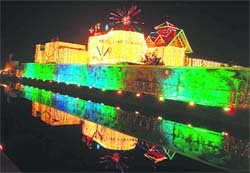 The revision has been filed against the orders of the CJM, who had earlier dismissed a criminal complaint filed on June 4, 2007, by Mukhtiar Singh, a resident of the local Barnala road, accusing the dera chief of maliciously insulting the religious feelings and sentiments of the Sikhs by wearing a dress similar to the one donned by Guru Gobind Singh. The CJM had dismissed the complaint. The complainant then filed a revision petition against the dismissal of the complaint in the court of District and Sessions Judge HP Singh. The court said in its order that when a similar case had already been registered against the dera chief on same cause of action in Bathinda, where the actual cause of action arose, there was no point of pursuing the case here. A number of Hindi scholars from Haryana, including Uday Bhanu Hans, Man Mohn Sehgal, Lal Chand Gupt Mangal, Rana Pratap Ganori, Vinod Kumar Taneja, Jitender Sood, Subhash Rastogi and Nand Kishore Sharma, were also present on the occasion. Kaushal said literature had an enduring impact on society. He said the epic would make an imperative place in the Hindi literature. Uday Bhanu Hans also spoke on the occasion. Principal of SD College Desh Bandhu said literature was the mirror of society. He said such literary activities encouraged the youth.